I'm engaging a builder to undertake some works on my house, including installation of a covered deck and the construction of a cavity through the (weatherboard clad) wall onto the deck. I need to find a suitable dooring solution for the cavity. The cavity will be about 2.8 to 3m wide, spanning the full distance between structural posts. I would like the doors to open as wide as possible. 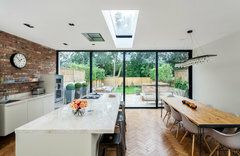 I prefer not to use bi-fold doors as they will protrude too far beyond the wall when fully open. My preferred configuration is a centrally opening pair of sliding doors mounted on the exterior wall. Each panel would be about 1.5m wide (or could equally be a pair of 0.75m off the shelf doors). The doors could slide away into a cavity attached to the outside wall. Add a second track and we would have a simple configuration for a pair of fly screens that also slide away when not in use. 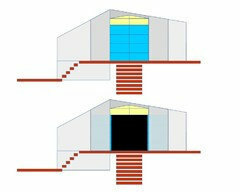 The sliding doors could be top or bottom supported, depending on what is easiest to implement. Am I deluding myself that this is a fairly simple configuration that should be easy to implement? And that it should have no greater weather sealing issues than other exterior sliding door configurations? My builder wasn't encouraging when I raised the prospect with him. Where can I turn for advice and assistance? Basic door and deck concept. 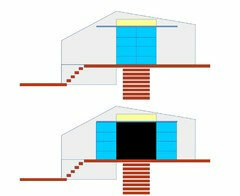 As above, with exterior offset boxing to house the doors when open.Note, hot water service is to be moved for the deck build. Deck will be 3m wide. I should note that a roof extension will cover the right hand portion of the deck, including the doorway. We had an external wall-hung door on an older house. It was a barn door original! With building you can generally do most things if you throw enough money at it and get the design right. What you describe is not an off-the-shelf product, and I have never seen an external pair of sliding doors that recess into the cavity (and neither has your builder). This doesn't mean you can't do it, it just means that you have to pay somebody clever and experienced to get the design and details right to create a bespoke piece of window joinery which is going to cost you big dollars. You will also have to engage an engineer to design the massive lintel that spans the 6m span if I am understanding correctly that two 1.5 metre wide doors, will need 1.5 metre of recess at each end. Internal recessed cavity sliders are often drafty things to live with due to the gap each door needs in the cavity so that the face of the door doesn't scrape. Somebody much cleverer than me will be able to figure out how your external cavity sliders won't be drafty. Maybe buy a 6 metre wide external sliding door/window unit and build it in? Or save yourself thousands of dollars in design and prototyping fees and buy something off the shelf, that doesn' recess into the wall, but still has the two central opening doors, that slide against fixed windows. Thanks Julia. That is an interesting idea. I imagine a continuous hinge would also make a trackless bi-fold more reliable. Given the span I'd be giving up a lot of space to a swinging door if it were all of 1.5m. But a trackless bi-fold might work. 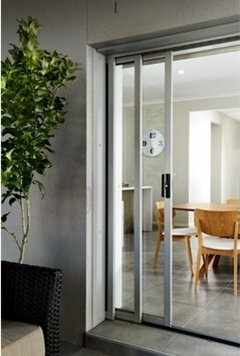 Anybody have any experience with trackless bi-folds and continuous hinges? Thank you. I really appreciate the input and the time you've taken to explanation your point of view. I really do want to get an understanding of where the issues lie in this design. So I hope you'll forgive me digging a little deeper. I don't quite follow why you think the design would require a 6m lintel. Yes, it does require a 6m track, but the track can simply be attached to the wall. The weight of the door need not be supported by the top track. It could be supported from below. The whole point of putting the configuration on the outside of the wall is to minimize the need to make structural changes to the building. There currently is no capacity to install a 6m wide external sliding door/window unit. Likewise I don't follow why the door should be any draftier than any other external sliding doors. The cavity is on the outside of the wall, so draft is not going to get in via the cavity. Other sliding doors of the unit type have the same draft problems this configuration would and solve it by using an overlapping flange at the front end of the fixed door and the back end of the slider. The same could be applied here, where we treat the wall as the fixed door. The point at which the doors engage each other has also be solved for other door configurations. It is just a matter of having a loose tongue and groove configuration. Again this is exactly the same as a unit providing center opening sliding doors. Finally the same sliding mechanisms are used in other sliding door configurations, so I don't see why that should be any draftier here either. For an off the shelf compromise, have you looked at Trend Quantum cavity stacker doors? I don't really have the room internally for a cavity stacker. siriuskey - a large sliding door off to the right would open on the wrong side unfortunately. Day to day access would be severely compromised. A cavity stacker on the outside wall would be fine. But that is exactly what I'm describing for a single leaf. Sorry I misunderstood, I thought that you were talking about doors that are recessed into a cavity within the wall, like an internal cavity slider, which fits within a 90mm stud wall, as you have a weatherboard house. In this photo you can see that the lintel needs to span four times the width of a single leaf door as the battens either side of the cavity are too slender to be structural, they are just there to hold the wall cladding. If you thicken up the wall to provide structural support either side of the cavity then you won't have the really long lintel issue, but I am not aware of side mounted sliding door tracking. Lots of fiddly and tricky details to be resolved which would be beyond the scope of your builder (and who wouldn't want to guarantee it). Thanks for all the input. In the end, seems to be more trouble getting it realized than the value I would get from it. 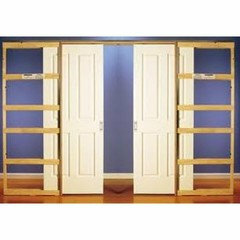 Plan to install 2 sets of French door pairs side by side instead. Still get to open the cavity fully for ventilation on occasion. And get an opening as wide as a sliding door would provide, with panels laid flush to the exterior wall, if I leave one center panel closed. For day to day use, I prefer a swing door over a slider anyway. Siriuskey, yes, two center doors back to back. So if both open, would sit at 90 degrees to the wall. If only one open, other 3 doors could all lie flush to the exterior wall. What's more, if there are enough occasions that I wish I had a full opening, I'm pretty confident that a minor modification to the center door support post would make the whole assembly removable and restorable. External roller shutters on sliding doors? External Colour Choice - help requested!